United States and State maps in an editable PowerPoint Presentation. Easily edit state and county objects to define regions, territories, etc. Add your own data and elements or resize to fit your presentation! Editable United States PowerPoint® Maps for Business, Sales and Marketing Presentations! All 50 States PLUS a Master United States Map! 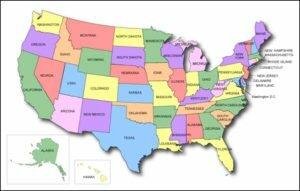 This powerful map package contains 51 PowerPoint Files including all 50 states with counties plus a master United States slide with state names. Each slide contains a state map which is completely editable!